The baroque Wackerbarth castle was built in 1727 by Count August Christoph von Wackerbarth. The castle looks back on a volatile history and changed hands multiple times. 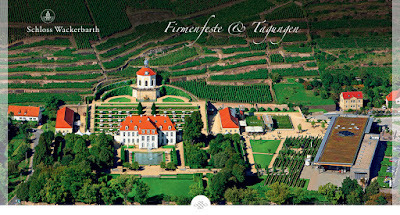 In 1928 a wine estate was founded at the castle, which even survived the GDR times. During GDR times it became a socialist co-operative VEG (volkseigener Betrieb / company owned by the people). Along the Radebeul vineyards, where counts once resided and the court of Augustus the Strong used to hold glittering parties, today there is an ultra modern winery owned by the State of Saxony, who took over the castle, grounds, and vineyards after reunification. The Schloss Wackerbarth wines benefit from very favorable climate conditions. The Elbe river dampens the harsh winters and the vineyards are on steep sun-kissed slopes. Schloss Wackerbarth is famous for its Sekt, produced according to the Méthode Champenoise. We toured the baroque Schloss Wackerbarth and the modern winemaking facilities, before sitting down in the tasting room for a portfolio tasting of Sächsisches Staatsweingut Schloss Wackerbarth. The Sächsisches Staatsweingut Schloss Wackerbarth is located in Radebeul in Sachsen and owned by the Federal State of Sachsen. It is Germany’s 11th largest wine estate. This beautiful style palace was one of the many pleasure palaces and country residences build near Dresden under Augustus the Strong. Schloss Wackerbarth was constructed by Christoph August von Wackerbarth, who was a Minister in the government of August the Strong, between 1727 and 1730. After his death, the castle was inherited by Joseph Anton Gabaleon von Wackerbarth-Salmour and had in the following 200 years various owners, including Dresdner Bank. In 1952, after World War II, it became the socialist wine co-operative VEG Weinbau Radebeu. Efforts to privatize the wine co-operative after the fall of the Berlin Wall by the Treuhand privatization organization in 1989 were not successful and the estate finally was taken over in 1992 by the Federal State of Sachsen. In 2002 the State of Sachsen decided to renovate the castle and transform it into a “Erlebnisweingut” with an educational mission. The vineyard area totals 94 hectares. Some of the vineyards are terraced and on steep slopes, along the Elbe river. The main grape varities are Riesling (25 ha), Elbling (12 ha), Müller-Thurgau (10 ha), Kerner (9 ha) and Pinot Blanc (7,5 ha) as well as Pinot Noir, Dornfelder and Regent. This year, the dinner we had at L’Auberge du Cheval Blanc in Lembach was the best we had among a number of top meals during the 2018 Germany South/ Alsace Tour. L’Auberge du Cheval Blanc in Lembach, Alsace, is a 4 star, beautiful place with pool and spa facilities. close to the German border in Wissembourg. run by Monsieur et Madame Bastian. Pascal Bastian is a 2 Michelin star chef and the restaurant is known for its refined cuisine known well beyond the Alsace region. Chef Pascal Bastian has trained at top restaurants in Switzerland and France– among them the 2 Michelin star restaurant La Plaissance in Saint-Emilion, before he acquired the Auberge Cheval Blanc and its restaurant in 2008. It did not take him long to be awarded with 1 Michelin star and shortly after with the 2nd Mchelin star. We had dinner there and stayed at the Auberge du Cheval Blanc for one night. Cheval Blanc: An authentic 18th century coaching inn, located in the heart of a charming village in Alsace. The Cheval Blanc - Lembach is an Alsatian restaurant with a rich history, where fine cuisine is served in a welcoming atmosphere. Discover a prestigious establishment that has lost none of its original character. The spacious and warmly decorated dining room features parquet flooring, coffered ceilings, wood panelling and stained-glass windows. A period fireplace adds a further touch of warmth to the interior. 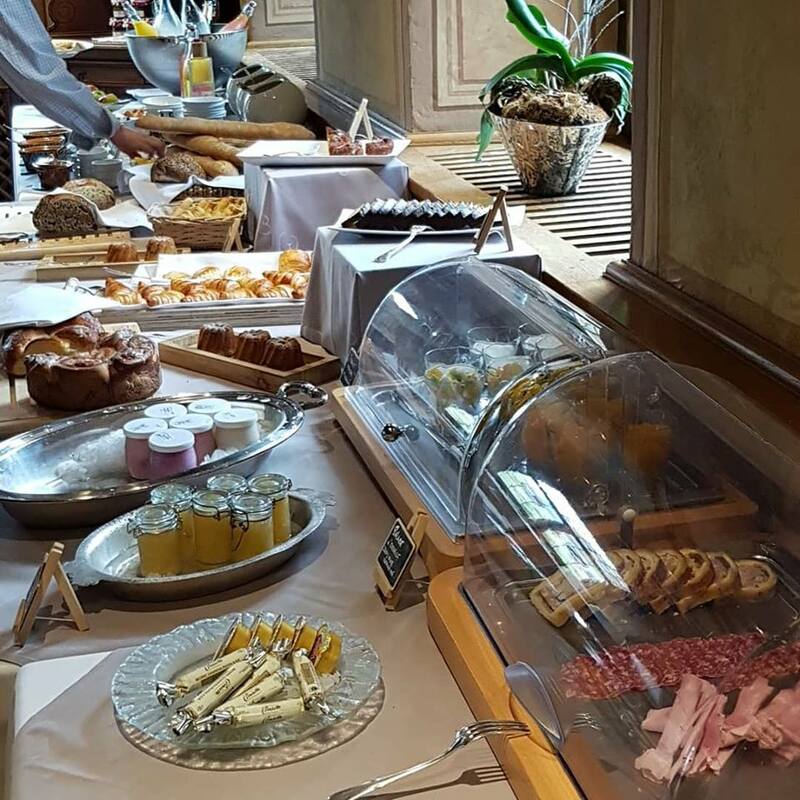 Located in Lembach, not far from Haguenau and less than an hour from Strasbourg, our authentic gastronomic restaurant promises special moments to share. Enjoy seasonal cuisine in a cosy and refined atmosphere. The dishes created by Chef Pascal Bastian and his team offer a culinary experience that deliciously blends tradition with modern influences. The restaurant was awarded its first Michelin star in 2009, followed by a second in 2015 – a success that we are proud to share. Comfortably seated at a table in our gastronomic restaurant, enjoy seasonal dishes with subtle local flavours that pleasantly surprise the taste buds. The menu created by two-Michelin-star Chef Pascal Bastian gives pride of place to local Alsatian produce, with modern and imaginative creations, such as traditional foie gras with Gewurztraminer wine, 'Duwehof' pigeon, fillet of 'Fleckenstein' venison, hare à la royale with spätzle, and soufflé pancakes with kirsch. Experience an original culinary voyage, with a number of pleasant surprises along the way, from the local flavours, to the presentation of the dishes, the cooking and the seasoning. Guide Michelin: Dans le charmant village de Lembach, à moins d’une heure de Strasbourg en Alsace, se trouve la prestigieuse Auberge du Cheval Blanc. Avec deux étoiles au guide MICHELIN, le restaurant au cachet d’antan offre une cuisine de saison mêlant tradition et modernité. Pascal Bastian saura ravir vos papilles. Le chef du restaurant est curieux et nous propose à la carte des associations de goût et de produits étonnants et innovants. Ainsi à l’Auberge du Cheval Blanc, vous pourrez vous laisser surprendre par les de ris de veau rôtie infusée au foin ou encore par les tourteaux et le caviar « Osciètre ». Situé dans un ancien relais de poste du 18ème siècle, plongez dans une ambiance au charme ancien. L’Auberge du Cheval Blanc possède un cadre chaleureux grâce à ses boiseries et sa cheminée. A l’entrée du restaurant, ne manquez pas la fabuleuse vue sur le ballet des cuisiniers. Au bord du parc régional des Vosges, le restaurant de L’Auberge du Cheval Blanc vous promet un voyage culinaire d’exception. Le mot de l'inspecteur: Ce noble relais de poste (18es. ), aujourd'hui mené par Carole et Pascal Bastian, allie charme alsacien et raffinement contemporain : c'est un plaisir que de voir vivre ainsi de telles institutions... Le chef maîtrise aussi bien le classicisme que l'inventivité, sa carte est riche et pleine de finesse : autant de caractère séduit ! Pascal Bastian: Après avoir été classé second au concours du « Meilleur Apprenti du Grand Est de la France », Pascal BASTIAN découvre pour la première fois, l’auberge du Cheval Blanc, de 1996 à 98, où il évoluera comme commis de cuisine aux côtés de Fernand Mischler. Chef de partie dans de grands restaurants gastronomique tel que "Le Pont de Brent" en Suisse, "Palm Square » à Cannes puis au Château de Reynats, dans le restaurant du Chef Philippe Etchebest, puis à « l'Hostellerie de Plaisance » à Saint Emilion, il achève son chemin à l'Arnsbourg en tant que second de cuisine avant de reprendre les rènes du Cheval Blanc. Organic Corn Sabayon, Malto "Farmer Bacon"
The next morning we enjoyed a wonderful breakfast at L'Auberge du Cheval Blanc before heading north to the Pfalz region (Germany).